In 2015, I chose release. I wasn’t eager for this word to take center stage in my life, but as a recovering control freak, I knew I needed it. That year, I intentionally applied the word release as the Holy Spirit taught me greater reliance on Him. I didn’t have to wait long before I learned why hope is not only my word for 2017, it’s my husband’s, too. On January 4, he entered the hospital with severe abdominal pain. Tests revealed pancreatic cancer. While we waited in the emergency room for completion of the admission process, one of the nurses slipped a glass stone into my hand. “Here,” he said. “Hold on to this.” I glanced down and read the word hope etched in gold across the surface. If ever a diagnosis calls for hope, it’s cancer. These past months have been filled with doctor’s appointments and medical tests as my husband recovered from the surgery and receives further treatment. Radiation and chemotherapy are now our new normal. Through it all, we trust our Savior and hope in Him. But my family is not the only one facing difficult circumstances. We live in a broken world. A world that needs to be restored to its Creator. A creation that, as the Bible reminds us, is “groaning together in the pains of childbirth until now” (Rom. 8:22). A world of desperate people who need a Savior—who need the salvation Jesus Christ offers. Still, there are times when hope can fade, even for Christians. When we are burdened by our situation and long for heaven. When doubts assail and weariness overtakes us. When hope is deferred, and our heart becomes sick (Prov. 13:12). What seemingly hopeless situation are you experiencing? A diagnosis? A broken relationship? A financial need? Despite appearances, a child of God is never alone, for God has said, “I will never leave you nor forsake you” (Heb. 13:5). And “if God is for us, who can be against us?” (Rom. 8:31). Children instinctively know the scariest situations are neutralized by mommy’s presence. Similarly, children of God have the assurance their heavenly Father will always be near. Yet how sad it is that we often live as spiritual orphans, oblivious to the hope the Lord wants us to experience in His presence. 2. God is a God of hope. The Creator of the universe is the same God who provided a Redeemer for people hopelessly trapped in sin apart from the Savior. He sent His Holy Spirit so we can “abound in hope” (Rom. 15:13). Every Christian has the indwelling Holy Spirit. The apostle Paul reminds us the same Spirit who raised Jesus from the dead is living in us (Rom. 8:11). 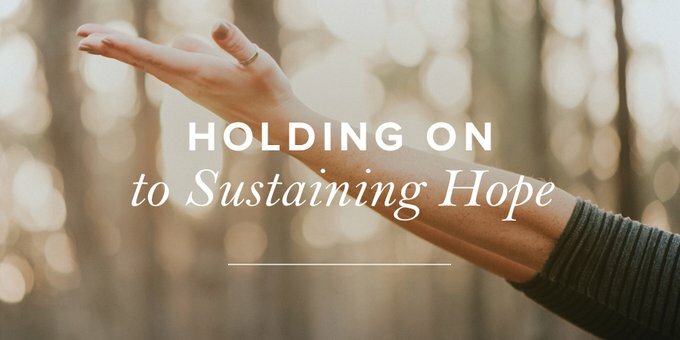 As we trust Him, one of the ministries the Holy Spirit accomplishes is to fill us with overflowing hope. A hope that flows from knowing who we belong to. 3. Suffering doesn’t have to negate hope. Our natural perspective equates suffering with hopelessness. But the Bible reminds us “suffering produces endurance, and endurance produces character, and character produces hope” (Rom. 5:3–4). Maintaining an eternal perspective can mean the difference between hope and hopelessness. As Paul put it, “If in Christ we have hope in this life only, we are of all people most to be pitied” (1 Cor. 15:19). Sometimes our heavenly Father allows us to experience seemingly hopeless situations because He is more concerned with changing and growing us rather than changing our circumstances. 4. Sometimes the only thing hope can do is wait. Our desire may be to control our circumstances, but the Lord is sovereign over both our situation and the timing of our circumstances. So “be strong, and let your heart take courage, all you who wait for the LORD!” (Ps. 31:24). I hate to wait. I’d much rather be doing something than doing nothing. And waiting feels way too much like doing nothing. But for the Christian, waiting is not passive. It’s active. While we’re waiting, we’re trusting. We’re taking courage. We’re exercising our faith muscles. The result is a confidence that God will hear His children and answer (Ps. 38:15). News accounts proclaim a world in chaos. Medical appointments yield the sad news that our bodies are yielding to the decay of our sin-sick world. Relationships break with discouraging regularity. But this world is not all there is. Our temporary circumstances will someday give way to the eternal reality of restoration and wholeness in the presence of our Savior. Until that day, hope is exactly what I need. How about you?